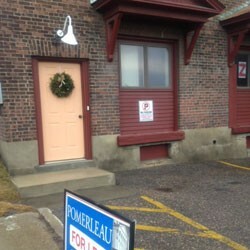 The building’s address is 266 South Champlain Street. But its main entrance — newly outfitted with a ramp and a handsome awning — faces Pine Street. In fact, it faces the Soda Plant at 266 Pine, across the corridor that anchors Burlington’s South End. If this sounds confusing, it probably won’t be for long, once word gets out that a precious commodity — artist studio space — is opening up at 266 South Champlain. What’s more, there’s free parking for tenants. After working through some zoning hurdles and a little interior construction, co-owner Nigel Mucklow expects to open the place by March. The long brick building tucked into the dead end of South Champlain, beside Curtis Lumber, is part of a four-building complex owned by Mucklow and Brian Shea. Their business, New England Floor Covering, anchors the Pine Street side in a building that also includes Aikido of Champlain Valley and Bikram Yoga Burlington. An adjacent structure houses Black Horse Fine Art Supply, Jazzercise and offices. Inside the “quad” formed by these buildings lies a private parking lot, hidden from view of either street. To the north, on the other side of a chain-link fence, stand the Bobbin Mill apartments. Curtis Lumber once leased the South Champlain building for its kitchen and bathroom showroom. Then, for a time, Woodbury’s of Vermont made bowls and other wooden products there. For an even shorter period, a grassroots evangelical congregation praised the Lord in a portion of 266 South Champlain. And then it sat empty for four or five months. Mucklow says the place proved too big to lease to a single occupant, but he and Shea were loath to carve the capacious, postindustrial space into small offices. “So we sanded the floors and fixed it up,” he says. And he called Christy Mitchell, 31, proprietor of S.P.A.C.E. and Backspace galleries in the Soda Plant. Mucklow says he likes how Mitchell divided her own cavernous rooms — with partial walls — into rentable artist studios, leaving open areas for art exhibits. He hired her to recreate that formula on South Champlain. So, yes, Mitchell now works at two buildings numbered 266. A second floor sits atop about a third of the building, at the north end. Printmaker Casey Blanchard will occupy that airy, 1000-square-foot space, which has an adjacent kitchenette and bathroom and, to the west, a sliver of a view of Lake Champlain. Downstairs, says Mitchell, “I’m helping design it, figuring out the spaces.” She notes that there will be “different price points” for tenants according to space requirements — $200 and up per month — but that 266 South Champlain Studios will be “slightly more upscale than S.P.A.C.E. Gallery in terms of where artists are in their careers.” She envisions attracting designers, architects and small-business entrepreneurs to the space. “It exudes professionalism but also creativity,” Mitchell says. She and Mucklow have been looking into the history of the structure, in part to find a name — à la the Soda Plant and Maltex Building down Pine Street — that can brand the place with something more than the duplicative numeral 266. Its original use “had something to do with canning,” says Mucklow, who adds that it’s been difficult to ferret out the full history. He did discover that the building still has a right-of-way to the nearby railroad. “That whole area needs some clarification,” Mucklow suggests. One thing’s clear: Another building in the South End is going creative. For inquiries about 266 South Champlain Studios visit miniurl.org/studioform.